Serbia was granted EU candidate status in 2012, with formal negotiations beginning in January 2014. In an interview with LSEE’s Tena Prelec and EUROPP’s Managing Editor Stuart Brown, the Chief Negotiator for the accession of the Republic of Serbia to the European Union, Tanja Miščević, discusses the timetable for Serbia’s accession, how the issue of Kosovo impacts upon the negotiations, and whether the Ukraine crisis and other foreign policy issues have the potential to influence the process. 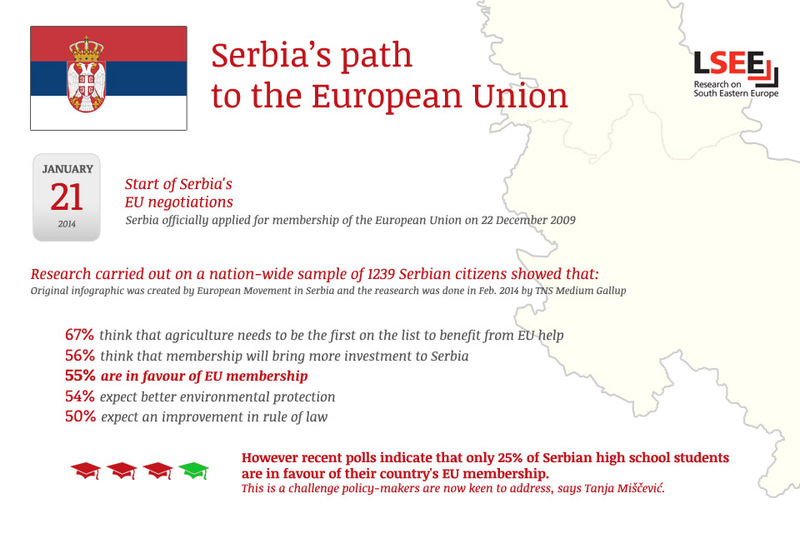 What is the timetable for Serbia’s accession to the EU? Negotiations formally opened on 21 January this year, but we marked the beginning of the actual talks with the opening of the screening exercise in September 2013. Nevertheless, we are already devising our plans for the continuation of the process. We have based our analysis of when talks will be finalised on the assessment given by the European Commission that Serbia is ready to implement and harmonise with the EU’s acquis communautaire in the ‘medium period’, which means around 3-5 years. So we calculated that by the end of 2018 we will be ready to assume the obligations arising from EU membership. Afterwards we will still have to prove that we are able to implement the required actions completely and then we will have further assessments of how the EU’s next financial package can be used. That is the plan, but definitely our goal is not only to negotiate membership, but also to achieve a good deal for Serbia, as well as using the negotiation process to change and improve our structures and institutions. In this respect, people in Serbia are pro-reformist: in fact they are much more ‘pro-reform’ than ‘pro-EU membership’, according to some recent opinion polls. On the other hand, they are also aware that you cannot achieve the level of reform we are discussing without the attraction of EU membership and the EU providing expertise, experience, oversight and financing for the reform process. So while reforms are the most important element, without the end goal of membership these reforms could not be pursued. I’m always very reluctant to put a firm date on when membership itself will actually be achieved, but certainly I would say that there is no possibility for Serbia to become a member of the EU prior to 2020. So 2020 is a very important year for us. It would mark two decades from when our accession process really started in 2000, which is when we first started aligning with European integration. We have seen from previous enlargements that passing laws is only one aspect of the process: the other crucial aspect is implementation. How are you ensuring that implementation is carried out effectively? This is exactly our understanding of the situation. It is not that the conditions have been changed from previous accession countries, but the bar is perhaps a little bit higher for us than it used to be. We are aware of this and when you are aware of a problem you know how to deal with it – or at least you understand that you will have to deal with the issue at some stage. But for us this is not a new process: we started harmonising with EU standards as far back as 2004, on a voluntary basis without any obligation. So we already have experience of implementing laws which are in accordance with EU standards. Are we completely satisfied with the situation? Absolutely not and we have realised that we will have to put emphasis on implementation at the local, municipal levels, including with regard to the work of judges and police officers. The key issue for me, as a Serbian citizen, is not the text of a law or how it has been adopted at the national level, but the actual implementation of laws on the ground. The most important aspect is that Serbian citizens must be able to call upon laws which are in accordance with EU standards and be able to protect their rights. That is something that we are going to work very hard on. The issue of Kosovo will affect every element of the accession process. Given that Serbia does not exert effective control over the territory, what specific arrangements have been put in place to deal with Kosovo as it arises in various chapters? For example, have you asked for an exemption in terms of extending the acquis to Kosovo, as Cyprus did over the areas not under its effective control? There are two elements in answering that question. First of all, we tried to explain before the EU accepted the negotiating framework that the most efficient way of dealing with all of the various factors relating to Kosovo would be to put all of those issues into Chapter 35 of the negotiations. We have already experienced some issues in the other chapters where Kosovo plays a role, but we have proposed that whenever these issues arise we either discuss it as part of Chapter 35, or we make it part of the EU-facilitated Belgrade–Pristina dialogue. This is because once the issue is solved at the political level it’s easy to follow this through in our negotiations over different chapters. For example, one of the elements of the dialogue was mutual recognition of diplomas between Belgrade and Pristina. So when we opened the debate on Chapter 26, which is related to education, that chapter was not a problem because it had already been solved politically through the dialogue. This would be the model for any issues that may arise when we discuss some of the other chapters. The second important aspect is that we should negotiate membership in accordance with UN Security Council Resolution 1244, which was adopted back in 1999 and is the main international document dealing with the issue. In this resolution nobody questioned the sovereignty of Serbia with regard to Kosovo, but gave the possibility for Kosovo to undergo its own reform process in terms of the transitional authorities and the institutions in Pristina. So we cannot use the principles which were used during the Cyprus talks – it’s not something that can be used in our case. One of Serbia’s key aims is to create a sound financial environment. Will Serbia be carrying out a large-scale privatisation campaign and if so how can you ensure you avoid some of the pitfalls experienced in neighbouring countries, which have seen industries end up in the hands of only a few individuals? Unfortunately, up until now we have not been particularly successful in terms of the privatisation of publicly owned companies. That’s why we now need to investigate what happened with the 23 unsuccessful privatisation deals which the European Union has raised concerns about. We will therefore still need to discuss what is going to happen with these companies, but also with some privately-owned companies that are considered to be ‘national jewels’, such as those in telecoms and energy, where we would like to determine what will happen not so much in terms of selling, but with regard to trying to find strategic partners and so on. But we did not learn from the experiences in other countries. We do not have a monopoly, but we have a problem with some privatisations that went wrong – some of the owners did not fulfil their part of the deal and even neglected the conditions of the privatisation that they established afterwards. It is obviously a huge problem which is based on the fact that there is not a clear system and that the institutions do not work properly. Improving these institutions is one of the very important elements of the reforms that are needed, such as through the new law on privatisations that is supposed to be adopted. It is closely connected to the restructuring of the publicly owned companies, in order to see if there is going to be the need for them to be sold or privatised. It is still under discussion and it is one of the priorities for the new Serbian government to debate. Media ownership and control is another key issue. Are there any reforms planned by the Serbian government in this area? This is also a very important issue. According to the media strategy that was developed and adopted back in 2011, up to now we were supposed to create a legal framework which will cover media, electronic media, public broadcasters and financing of the media, including clarification of ownership structures. So far, we have not fully achieved this. Two of those laws, the first one on public information and media, and the second one on electronic media, have been drafted and sent to Brussels because now we are under the obligation for Brussels to check each and every law that we are producing. They have some recommendations, but overall there is a positive assessment on these two laws. However the third one, the law on public broadcasters, is still a topic of public debate. This is a huge issue. We have two public broadcasters, RTS and RTV, and also a publicly owned news agency, which is sponsored and receiving money from the state budget. This is of course possible, as each country has a public broadcaster, but the options for supporting it and questions of influence are also something that have to be treated carefully. We also need to establish a proper ownership structure and competition between media, and this is one part of that law. This is important because the ownership structure is the factor which can determine influence over the media, particularly in a time of economic crisis and austerity. Journalists need to be protected from being subject to influence because of the bad economic situation, political influence or censorship, which can be a huge problem. For the first time, these three laws will be created after the debate between the three interlocutors, which is why it took us a little bit longer to carry out these reforms than we initially thought. Some EU politicians have voiced the concern that if Serbia does not align itself with the EU’s foreign policy, this might slow down its EU accession prospects. Looking specifically at the case of Ukraine, do you think this might influence Serbia’s position over the crisis, and its relationship with Russia? First of all, it is not true that we are not aligning with the Common Foreign Security Policy’s (CFSP) common positions. Last year we aligned with over 80 per cent of these positions. The CFSP is certainly one of the obligations in our negotiations and there will be a specific chapter – Chapter 31 – dealing with this issue. However the issue goes much further than this – for us it is about becoming a real partner in the foreign and security policy of the EU, which we really think we are. It is very clear that Serbia could not take any other position than saying that we will support the territorial integrity of any sovereign and recognised state. That goes without question because we have placed great emphasis on this extremely important principle in international law given that it is also important for us in relation to Kosovo. But on the other hand, the EU member states do not have a clear stance toward the crisis and toward sanctions against Russia through which they could understand our position. And I am not speaking about a traditionally good relationship between Russia and Serbia, but about contemporary political needs and the economic needs of the country – in terms of energy cooperation with Russia and politically in terms of standing together very firmly with us on Kosovo. I think we have gained that type of understanding within the EU. Is that going to be an excuse for us not to align with the CFSP’s common positions? Absolutely not. We understand our obligations and we will continue working with the EU in achieving that alignment. Not all EU enlargement processes have gone quite as planned, and there are today great concerns among European countries, the UK especially, on the topic of migration. How do you react to these concerns? During my meetings in London it has been confirmed to me that the UK is heavily supportive of enlargement. They are unreservedly supporting Serbia and its European path, while of course putting emphasis on the fulfilment of the criteria. But on the other hand, we are of course well aware of the debate going on in the UK and other countries regarding migration policies. It is a very important topic and it will continue to be so in the future. It is up to us to prove that we will not be creating a problem in this sense, and we understand that there will be a transitional period for the free movement of people from new EU states, as has been the case for other states in the past. This transition period is needed for us to change ourselves and create the structures within our country to convince those who are keen to move, to stay and work in Serbia. We are therefore aiming at creating an environment which will resemble those countries in Europe which perform well. Is your job in any way hampered by the fact that the current head of government is the former Minister of Information under Slobodan Milosevic? I don’t see that as a problem. I see a Prime Minister who is clearly devoted to the European path of Serbia, capable of delivering results, influential in terms of having the possibility to solve the issues, very enthusiastic, with a lot of energy to do the job. And I see it as my obligation to help him in doing that. This article was posted simultaneously on the EUROPP Blog. A podcast of Tanja Miščević’s recent lecture at LSE is available here. Tanja Miščević is Chief Negotiator for Serbia’s accession negotiations with the EU. She is also a former State Secretary of the Republic of Serbia Ministry of Defence and is a Vice President of the European Movement of Serbia. This entry was posted in Current affairs, Interviews, Kosovo, LSEE events, Serbia and tagged EU accession, EU enlargement, European Union, Kosovo, Russia, Serbia, Ukraine, Ukraine crisis. Bookmark the permalink.